The tetracycline repressor (TetR) is a bacterial protein that binds to specific DNA elements referred to as Tet operator (TetO) sequences typically located in the promoter region of a gene of interest. In the absence of ligand, TetR binds TetO and represses transcription. Upon the addition of a ligand such as tetracycline or doxycycline, the repressor binding is removed and transcription occurs (Yao et al 1998 Hum Gene Ther). The LE-Tg(EF1a-TetR)1Ottc rat uses a ubiquitous promoter to express the TetR. The rat was designed to be combined with transgenic rats harboring TetO controlled transgenes but none are currently available. However, the rat can be combined with viral vectors containing the TetO DNA elements to repress transcription of a transgene until tetracycline or doxycycline is delivered. As of May 17, 2016, this strain is available as line #00761 at the RRRC. This rat is registered at the Rat Genome Database (RGD) as RGD ID# 9588587. Figure 1. Schematic of the EF1a-TetR transgene. The insert encoding a beta-globin intron and the open reading frame of TetR was amplified with linkered oligos and pENTR1A-TetR (Addgene #22265) as a template. This insert was recombined into the backbone pAAV EF1a DIO EYFP (Deisseroth Lab, Addgene #27056, digested with BamHI and EcoRI) using In-Fusion cloning mix (Clontech) to produce pAAV EF1a TetR (pOTTC338, Addgene #62194). The pOTTC338 plasmid was digested with MluI and RsrII, gel purified away from the plasmid backbone, and microinjected into fertilized oocytes harvested from a Long Evans rat by the NIMH Transgenic Core. Surviving pups were screened for the integrated transgene by PCR genotyping. This line (LE-Tg(EF1a-TetR)1Ottc) has 6 copies of the transgene per copy of Ggt1 (# copy per haploid genome) as determined by droplet digital PCR. Figure 2. Detection of TetR transgene expression in the rat brain. RIPA homogenates were produced from the cortex (CTX), striatum (STR), and substantia nigra (SN) of wildtype and transgenic rats, separated by polyacrylamide gel electrophoresis, and transferred to PDVF membranes. 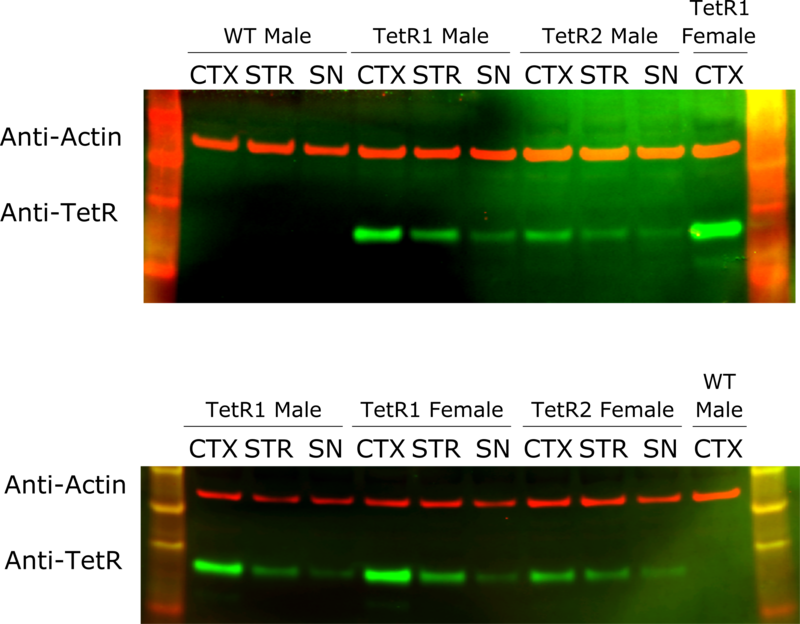 The blots were probed with anti-TetR clone 9G9 monoclonal antibody (Clontech Cat # 631131; green bands) and anti-Actin polyclonal antibody (Sigma Cat# A5060; red bands) then IR secondary antibodies were used for detection on the Li-Cor Odyssey. TetR2 corresponds to a different subline of the EF1a-TetR transgenic construct and is not available. Download print resolution version here.